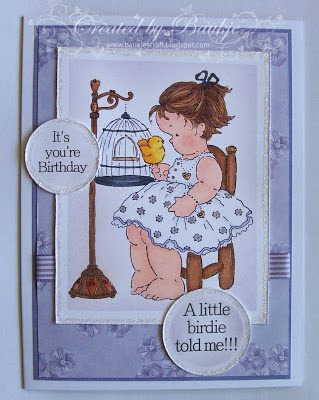 I needed to design a card using the Creatables bird die and also the Creatables leaf die so combined the two in one card. The sky was done buy sponging some ink over a scalloped circle nestie and the ground over a piece of torn card. 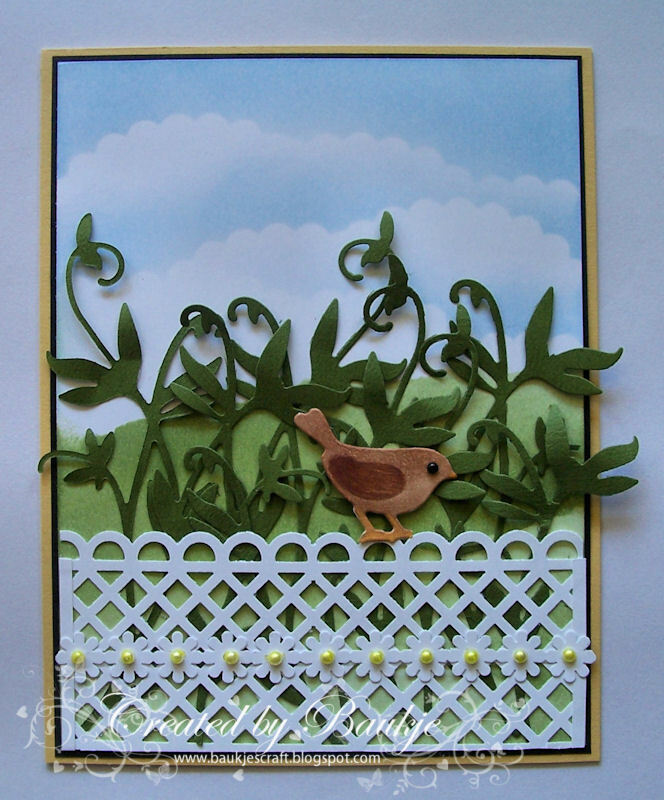 The fence is Martha Stewart's deep border punch Garden Trellis with a centre strip done with the Ek success slimline punch Daisy. to which I added some little flat backed pearls and as I didn't have any yellow ones I coloured them with a copic marker. I cut off the leafy branch the bird was sitting on and have coloured him with copics. 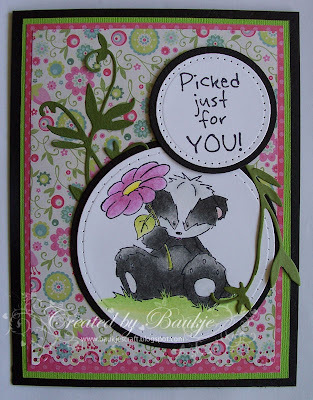 This very cute little image came free with a magazine, I have coloured it with Prisma pencils and OMS. 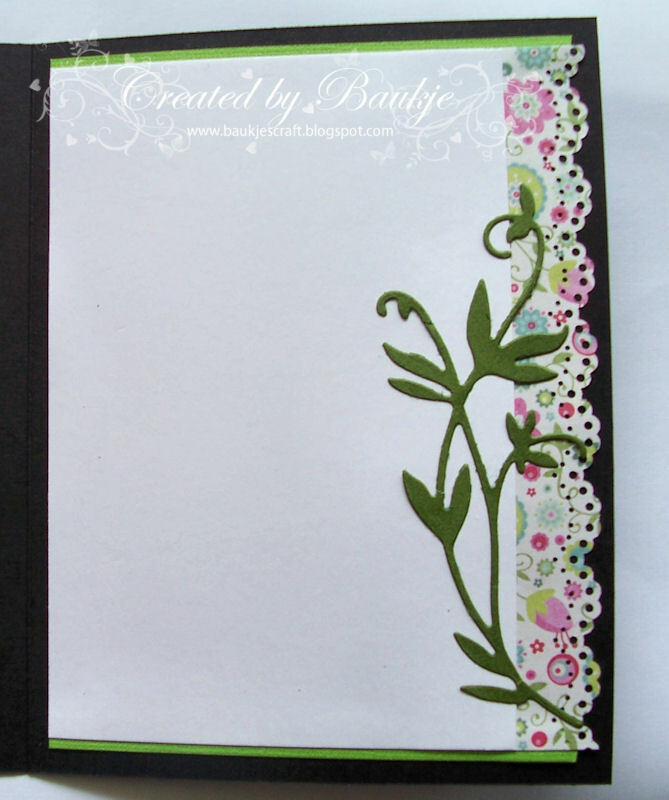 I paper pierced around the edges of both the white nestie layers. The leafy branches are a Creatables die and available from FatCats. 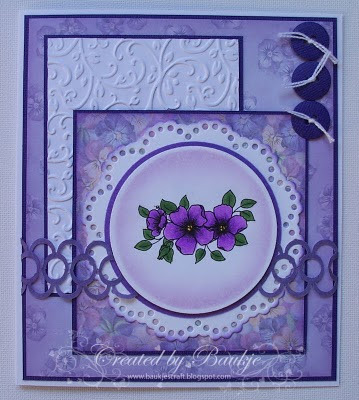 The border punch is Martha Stewarts Doily Punch. The designer papers also came free with a magazine. 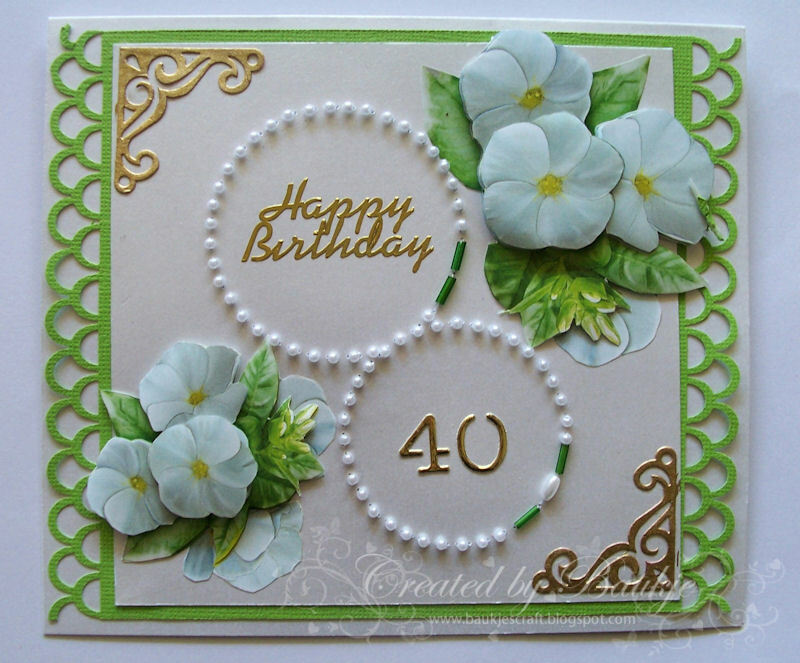 I have also used the leaf die on the inside of the card. I was going to say good Morning, but here it is mid afternoon already, so good afternoon to you. 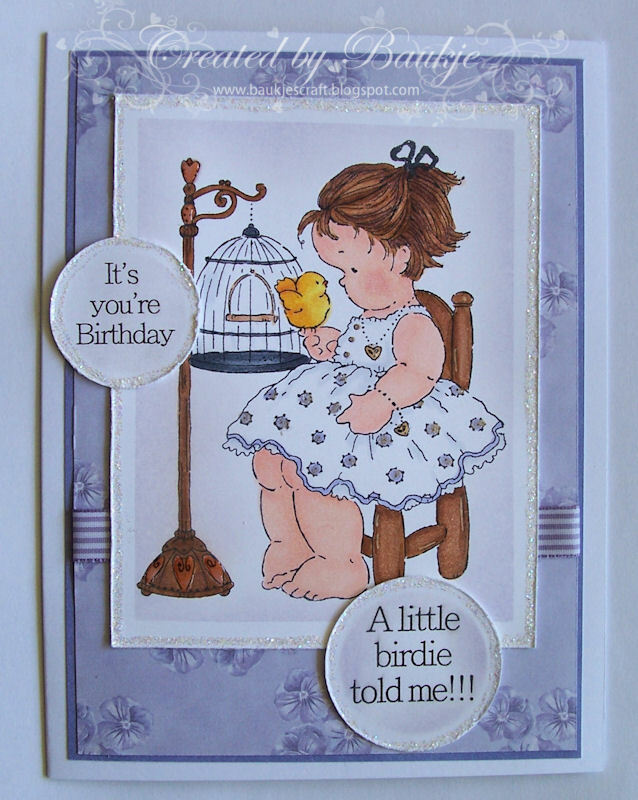 I have coloured this cute Penny black stamp, (check out those chunky little legs), from FatCats, with copic ciao markers, I then added some dimensional magic to her jewellery and the hearts on the bird cage stand. I have distressed all the edges on the stamped image and the sentiment layers then added some star dust stickles to the edges as well. The sentiments were computer generated. My daughters best friend is turning 40 and this is the card I made for her (the Circles are stitched on beads), it ended up being a bit rushed towards the end because I had to have it finished when my daughter came to collect her girls, they are having a surprise dinner for her tonight. I'm surprised I remembered to take a photo of it, I usually forget when I'm under pressure to get it done. It's school holidays here in Australia and we have had the pleasure of Chloe and Aimee's company while mum and dad are at work, I took them shopping this afternoon and we only got back a few minutes before their mum came to collect them. I've got another card to share today that I made for Kaaren at FatCatsCardCorner. 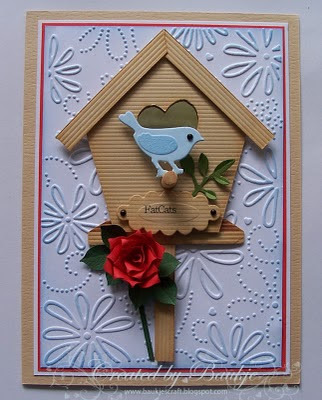 The embossed background is the Crafts Too Daisy and swirl embossing folder which you get from FatCats as well as the Creatables bird die. The bird house I have paper pieced, inking around all the edges before putting it together. The heart cut out birdie entrance has a heart shaped mirror behind it which you can't really see. The Dahlia Rose was made by me. The words area a little off centre, I had to put the little tag through the printer as it was one that was already cut and I don't have that die. I'm back with another stitched card, the roses I made with the Marianne creatable's 6 petal flower die from FatCats.the border punch is Martha Stewarts arch lattice and I finished it off with a triple tied bow. 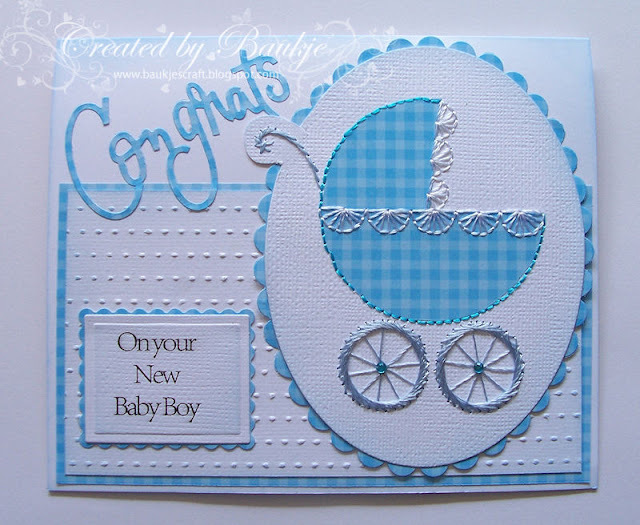 I needed to make a baby boy card so set to with needle and thread and stitched this baby's pram, to which I also added a bit of paper piecing before doing the stitching. 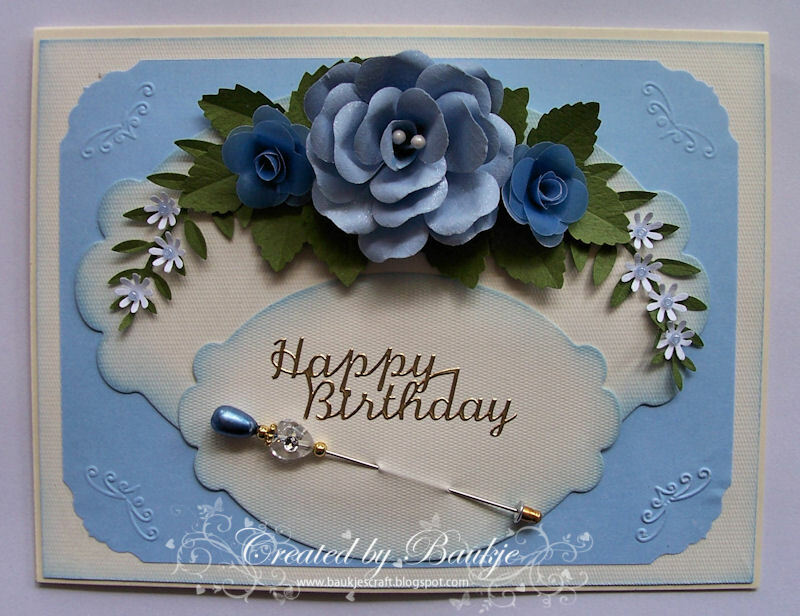 I have created two more cards for Kaaren at FatCatsCardCorner, and wanted to share them with you. 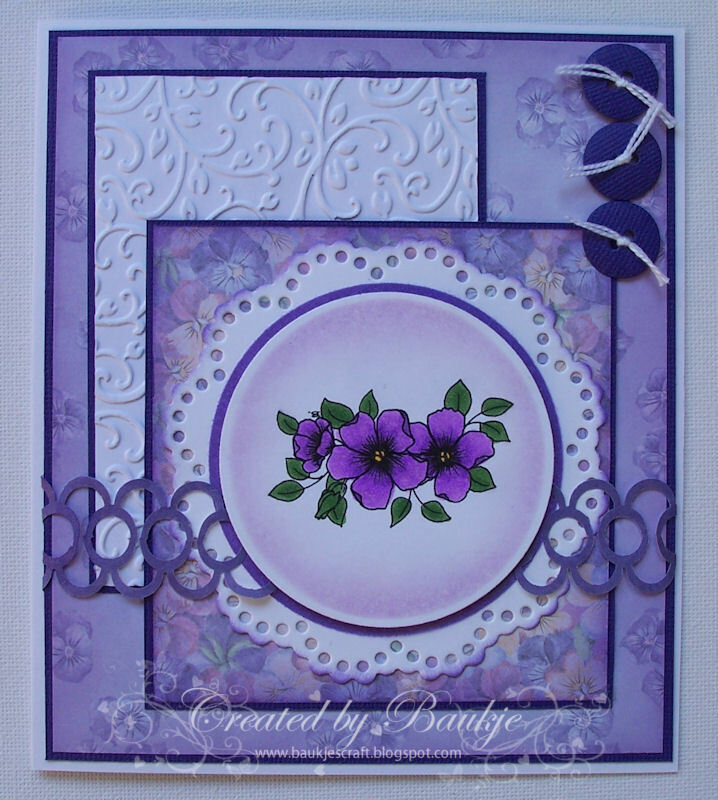 The one I call shades of purple I have used the Nellie Snellen Multiframe die set Doily flower for the focal image ( which I have coloured with copics) and the doily layer behind it, the little buttons were also made from the same set. The lacey strip I made from the Martha Stewart double loops border punch, by cutting a one inch strip of paper and punching first one side then flipping it over and punching the other side. 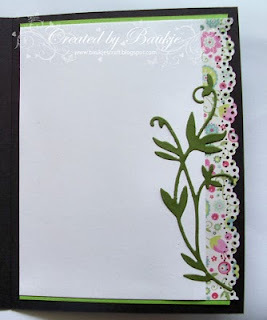 The embossed layer is the Budding Vine embossing folder from Craft Concepts. 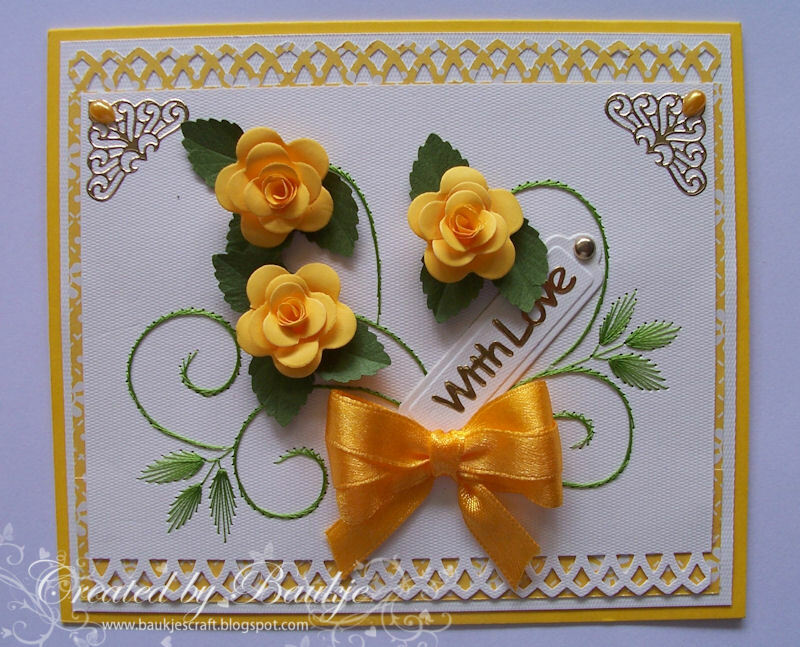 The yellow roses on this next one were made from the Marianne Creatables 6 petal flower die and the frame is the Nellie Snellen Multiframe Diamond die. 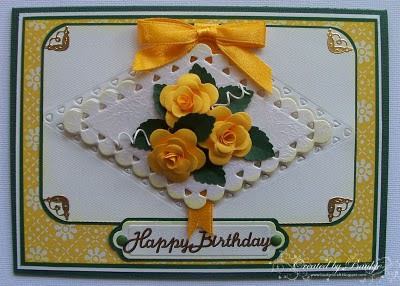 First I want to wish you all a Very Happy, and healthy new year with lots of time for crafting. 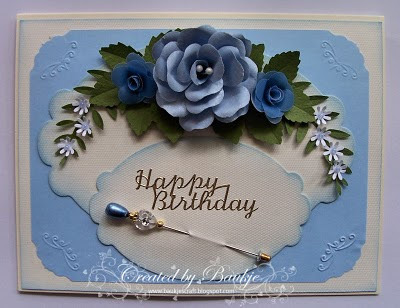 Then I wanted to share with you my card in lovely soft shades of blue and cream. 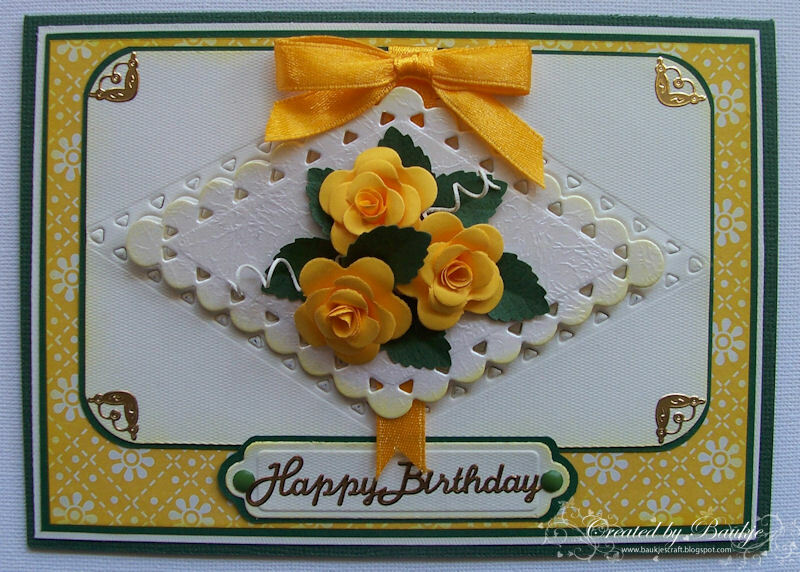 The large flower is the rose from Susan Tierney Cockburn's Book, The Paper Garden and the smaller rose is a design by Angie that she calls The ultimate Rose.